The arcade known as Churchgate and some surrounding shops were built in 1971 and have been the subject of much discussion, planning and controversy for many years. 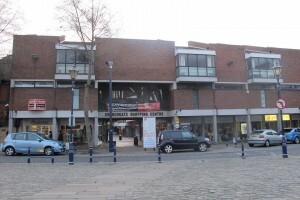 This culminated in the ill-fated proposals by Simons, involving 7 acres of the centre of town, were turned down by the Council (following a strong lead from the people of Hitchin and their Councillors) in January 2013. Details of this can be found on a timeline – click here. The current leaseholder, Hammersmatch, are seeking support from the owners, North Herts District Council, for refurbishment of the present buildings and a small development adjoining it on part of the site of the current market. Some outline proposals have been discussed locally, which are similar to those made public in January 2013 (click here). Discussions between Hammersmatch and NHDC are ongoing.